Metroid speaks in a variety of languages. Its predatory environment murmurs about its hidden dangers through violent color. The planet Zebes is covered in the sort of vivid purples, angry reds, and cold blues that poison dart frogs display so that other things won’t eat them. Music informs the emotions of bounty hunter Samus’ adventure. The stoic sound of triumphant jams like “Brinstar” encourages you to explore. Tempering that call to adventure is the discomfiting, bowel-shifting churn of “Zebetite.” Movement, from Samus’ forward jog to the unnerving swoop of the Metroids themselves, conveys volumes about the game, its world, and its history. Written language is not Metroid’s specialty. At least not until Samus lands on Research Frigate Orpheon in the first level of Metroid Prime. She spends only a few minutes there before moving on to the planet Talon IV, but that brief visit redefines the series. Research Frigate Orpheon marks the moment when words replace physicality as Metroid’s primary storytelling language. 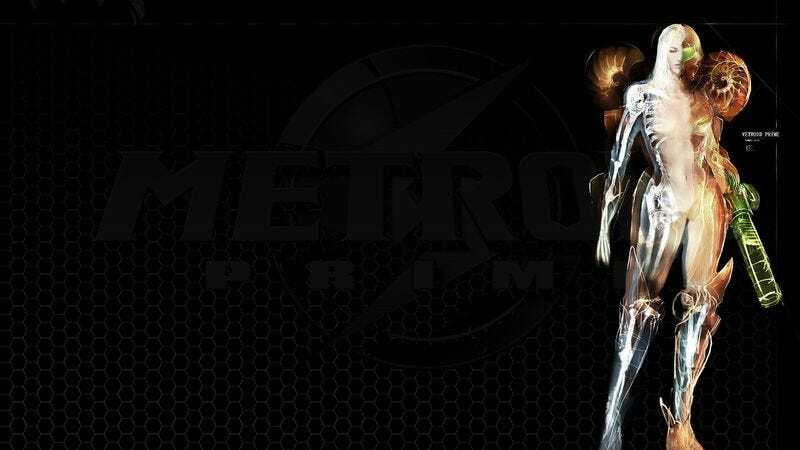 The Metroid series isn’t devoid of text prior to Metroid Prime, but it may as well be. The original game features a clipped prologue in the form of Samus’ orders to kill the titular beasts. “Defeat the Metroid of Planet Zebeth and destroy the Mother Brain the mechanical life vein—Galaxy Federal Police M510.” Beyond that and an equally terse congratulation message after finishing the game, the only other text in the NES Metroid pops up when you find an item, tersely describing what your newfound gadget does. “High Jump,” “Ice Beam,” “Energy Tank”—Metroid uses a minimum of descriptive language during the game. While Super Metroid, its second sequel, had a more robust intro with written narration from Samus herself and even a very early example of spoken dialogue in a Nintendo game—“The last Metroid is in captivity. The Galaxy is at peace.”—it doesn’t deviate from that sparse use of text. New equipment still gets a brief description, and you get reminders to save your game, but that’s it. Metroid Prime opens with even less contextualizing language, just a single sentence about Samus responding to a distress signal before we see her landing on Orpheon, seemingly exposed to outer space on the landing platform. The first seconds of Metroid Prime are striking, but the impression they give about what’s changed in the series is misleading. We witness Samus rendered in 3-D for the first time, seeing her red and yellow armor from angles other than the profiles and head-on views in older games, and that’s before the perspective shifts to the inside of that suit. Suddenly, Samus’ world is experienced through her eyes, the view augmented by the meters and information she sees inside that high-tech helmet. Within a few steps, it seems like Metroid Prime’s biggest change is born of that new perspective. In order to open a force field to progress, Samus has to look up and aim at little red targets, shooting all four to move forward. Your ability to think about your full surroundings, what’s above and below you out of sight, dictates your progress through Metroid Prime—rather than the more immediately perceptible obstacles of its predecessors. That’s the first impression that Prime conveys, at least. But it’s nonsense. Just because you’re seeing things from Samus’ point of view and having to examine the space junk and gross critters in a more natural way than you would in a game where everything is seen in profile doesn’t equate to a shift in how you think about the place. The process of overcoming obstacles—figuring out where to bomb your way through a wall or uncovering a hidden item behind some freaky bird statue—is largely the same in Metroid Prime as in previous games. It’s only when you start using Samus’ visor to examine things, which restricts your ability to fight enemies, that Metroid Prime reveals its biggest change. Popping up the Scan Visor reveals a series of little orange and red squares around the environment. In fact, if you can’t figure out that you need to shoot the red targets to open the force field and enter Orpheon, scanning it with the visor will explain what you need to do. There’s plenty more to scan in this first level. You can learn what each of the targets are, or what model of spaceship Samus flies. Once you move to enter the frigate’s interior, the visor can even tell you what a door is, if you really need to know. Inside are desolate mechanical hallways, some creepy crawlies from the planet the frigate’s orbiting, and dead humanoid insect creatures. These are Space Pirates, the series’ other signature enemies beside the Metroid parasites. Their mutilated corpses littering the Orpheon would be spooky on their own, signs that something very bad happened here very recently, and that would cultivate the sort of mysterious, piquing atmosphere that distinguishes Metroid. The invasion of written language into Metroid is a mixed development. For the right type of person, the one who pored over strategy guides and the printed manuals that came with the old games, the expansive descriptions of precisely what you’re seeing on the screen were a fantasy come true. Even in Super Metroid, it wasn’t entirely clear why a bunch of walking bug dudes wanted to raise killer space jellyfish for the benefit of an evil brain in a jar. In Metroid Prime, the Space Pirate modus operandi of evil science experiments and weaponized detail are written out with bureaucratic precision and detail. Even if you weren’t the type to fantasize about the daily life of piracy or the taxonomy of spiked bugs, it’s still cool to be in Samus’ shoes when she learns how much those pirates hate-respect her by reading their pirate emails. Orpheon only hints at how expansive Metroid Prime’s dive into lore will become when Samus starts exploring the ruins on Talon, ruins built by the mystical bird people that raised her. At the same time, the addition of text commits two major crimes against Metroid. By explaining, paragraph by paragraph, everything from the history behind destructive scientific research to how a freaking elevator works, Metroid’s physical language is inevitably diminished. The architecture, lighting, music, and movement still speak loudly in Metroid Prime. It’s a beautiful, often haunting game even in Orpheon. But that language is drowned out by over-explanation in the omnipresent text. The wilting of Metroid’s mystique isn’t the big problem, though. The presence of so many information blocks to scan in Orpheon—not to mention a checklist for lore, items, and enemies scanned—will plague completionists, but most scans are at least optional. If you don’t like the text, just ignore it. The problem is that you can’t ignore it all, as there are things you absolutely must scan to proceed, whether it’s scanning a computer to unlock a door or an enemy whose weakness isn’t conveyed through its physical characteristics. Sometimes there’s simply no moving forward without bringing text up on screen, and that fundamentally changes the pace of exploration from a fluid, attentive trip through the frigate to a stilted pedantic shuffle to make sure you didn’t miss some essential scan. When the Research Frigate Orpheon inevitably blows up, as almost every place eventually does when Samus visits, the urgency of the game pushes you to just move—forget staring at the screen searching for more specifics. Samus’ suit gets messed up, her powers are stripped away, and she has to make a hasty escape to the planet below where a rich adventure awaits. Everything that comes afterward is defined by the language set by Orpheon, though. The primal physicality of old Metroid is replaced by the rich detail and gracelessness of its words.